A cold front will move into the region on Wednesday. Cooler air will arrive in by Thursday morning. Today and Tonight: A cold front will move very slowly across the WBRZ Weather Forecast Area on Wednesday, causing rather gloomy conditions. Skies will be overcast with scattered showers. High temperatures will struggle to reach 70 degrees early and northerly winds of 5-10mph will cause thermometers to fall later in the day. By evening, readings will be in the upper 50s and low 60s. Overnight, pockets of rain will continue with low temperatures slipping into the low 50s with northwest winds of 5-10mph. Up Next: Clouds and showers may linger beyond dawn Thursday. By the time rain shuts off, the two-day total should not be much greater than an inch. Even if some sunshine can peek out by afternoon, temperatures will not be able to leave the mid 60s thanks to northerly winds advancing cooler air into the region. Both Thursday and Friday night will bring low temperatures into the upper 40s. Afternoons will follow up with sunshine and highs in the low to mid 70s. The forecast for LSU Football playing host to Arkansas on Saturday looks pleasant. After a chilly morning, temperatures will climb into the low 70s by the end of the game. The next system looks much weaker and will pass the area on Sunday with a slight chance of showers but no significant change in temperatures. From the Tropics to Severe Weather: Tropical Storm Rina has maximum sustained winds of 60mph with a minimum central pressure of 997mb and is moving north 20mph. 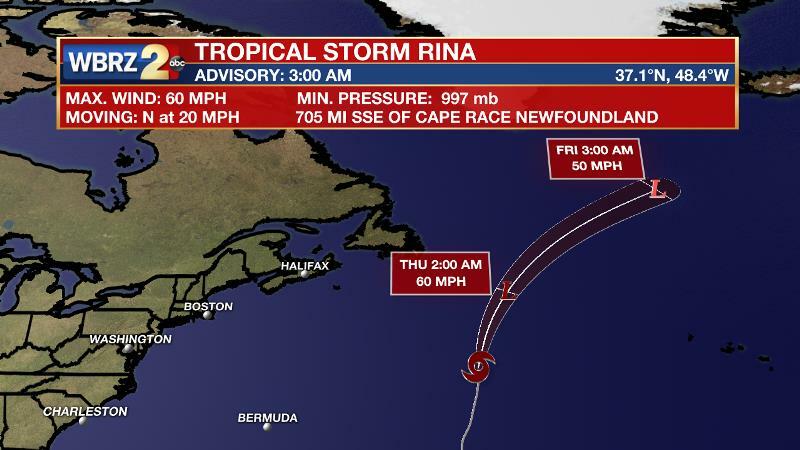 Strength is expected to hold as Rina accelerates out to sea, posing no threat to land. As a reminder, while we slowly turn attention off the tropics, it is important to prepare and be ready for the second severe weather season. On Wednesday, a shortwave trough will begin to suppress a ridge that has been in control of the Gulf Coast. In addition, a cold front will push it the area and is expected to have enough moisture to work with to produce periods of rain. Despite some upper level vorticity associated with the system, the parameters for thunderstorms, let alone severe weather, do not look favorable. A rumble of thunder is possible, but that is about it. Due to the jet stream and cold front being oriented west to east, movement of the boundary will be slow. Ultimately, it will take the kinking of the jet stream by the shortwave trough to kick the front through. As a result, clouds and showers will be prolonged, likely well into Thursday morning. Forecast models are allowing for up to an inch or so, locally higher amounts could stem from any persistent pockets of rain. Cold air advection will begin behind the front, reinforced by an area of high pressure in the northern tier of the country. By Thursday afternoon, some sun is expected, especially for area north of I-12. Northeasterly winds will result in high temperatures remaining in the upper 60s even if some sunshine occurs. 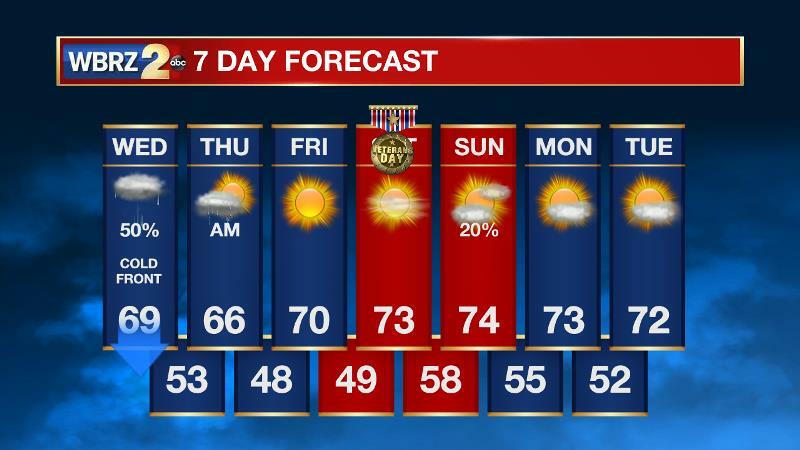 The coldest two nights will be Thursday and Friday with some pockets in the upper 40s possible—especially north of I-12. Afternoon sunshine will bring highs back to seasonable readings in the mid 70s. A weak disturbance and reinforcing front brings a slight chance of showers on Sunday followed by continued seasonable temperatures into early next week.